Emma the bear was captured 27 years ago so she could breed more of her kind. She is pictured here in a water bath as the temperature hovered near 37 degrees. KARACHI: Twenty-eight year old Emma is preparing to enter her cage to eat and rest. 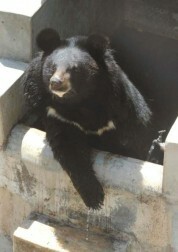 The Balochi black bear, according to her caretaker, “does each and everything on time”. Some children are standing at the edge of the pit where Emma can roam free and as she turns towards her cage, they throw food pellets and fruit at her to grab her attention. Emma, unlike other animals of her breed, ignores the childish assaults and enters her bedroom, a small cage at the corner of the pit. The Baloch black bear has been living here for the last 27 years. Her journey to Karachi was long and difficult. She was only two months old when her home in Balochistan was invaded. Her siblings managed to escape but Emma was entangled in the ropes of the hunters, immobilised by a tranquiliser dart in her neck. She was first moved to Peshawar, then Lahore and finally, on the request of the city’s wildlife department, Emma was brought to Karachi. Emma is the only bear in the zoo and one of the top attractions that brings scores of families and excited children to her pit. Her pit is full of fruits and stones, gifts from overzealous toddlers or prompts from bored sightseers. Emma belongs to one of the sub-species of the Asiatic or Himalayan black bears. She is medium-sized and has ears that are proportionately larger than the rest of her head. Bears of Emma’s kind have a distinct white patch on their chest, sometimes shaped like a V. They also have a patch of white fur on their chins. Emma gets up early in the morning and wanders out of her cage. Her morning ritual is strange and somewhat worrying-she hits her head against the walls and looks at the visitors for a long time, said Khan. She is a reserved creature who seldom shows her emotions. Her eyes are often blank, expressionless, lamented the caretaker. According to the city government’s zoo and aquarium officer, Emma was brought in to the zoo because the Baloch black bear species was vanishing. “We wanted to protect her kind and that is why she is here,” he said, adding that the bear is healthy and happy. He said that the zoo provides Emma with everything she needs. Dr Saleem Kamran, a zoologist and wildlife activist, does not agree with the zoo official. “It looks like they [the zoo officials] do not know what spending 27 years in a pit means to an animal,” he said. According to him, the average life of a Balochi black bear is 28 years, which means that Emma is well past her prime and can die very soon. According to the caretaker, Emma has already started showing signs of weakness. She sleeps 14 to 16 hours a day and has abandoned her morning walk for the last eight months. “If they really wanted her to breed, why is she alone?” challenged Dr Kamran. This species of bear reaches puberty at the age of four years. The optimum age for breeding is between four and 12 years. Dr Kamran fails to understand why the zoo has not provided Emma with a mate. The only way for the zoo to save her species would be to provide her with a suitable male bear so that their kind could be preserved. “If the CDGK, which runs the finances of the zoos in the city, can import four elephants why can’t it look for a bear in the country?” he said, criticising CDGK officials. Dr Kamran is not alone in his disapproval of the city government’s zoological programmes. 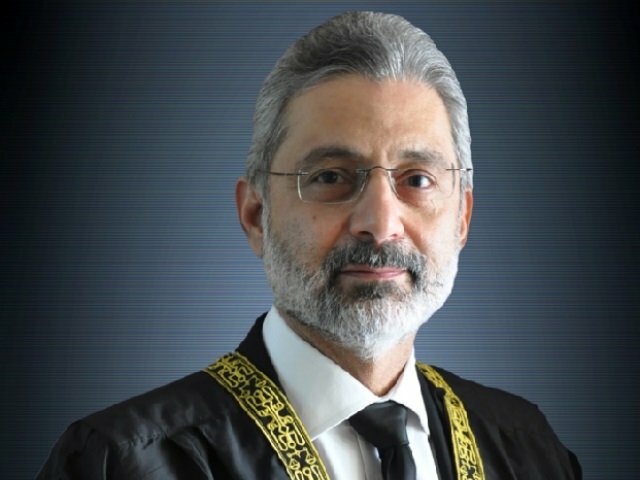 The director of the World Wildlife Federation-Pakistan, Ghulam Akbar, believes that the CDGK is not interested in protecting animals or education children, which are the two main reasons for setting up zoos. The financial authority should be with the zoo officials rather than the city government, he said, adding that the zoo had to find mates for all single animals.